References m_checkOrder, m_iMaxColumnHeight, m_iMaxColumnHeightID, m_iSpaceAfter, m_iSpaceAfterID, m_pPreviewWidget, m_spinHandlerID, m_windowMain, m_wlineBetween, m_wMaxColumnHeightSpin, m_wpreviewArea, m_wSpaceAfterSpin, m_wSpin, m_wtoggleOne, m_wtoggleThree, and m_wtoggleTwo. References m_iMaxColumnHeightID, m_iSpaceAfterID, m_oneHandlerID, m_spinHandlerID, m_threeHandlerID, m_twoHandlerID, m_windowMain, m_wlineBetween, m_wMaxColumnHeightEntry, m_wMaxColumnHeightSpin, m_wpreviewArea, m_wSpaceAfterEntry, m_wSpaceAfterSpin, m_wSpin, m_wtoggleOne, m_wtoggleThree, m_wtoggleTwo, s_HeightSpin_changed(), s_line_clicked(), s_MaxHeightEntry_changed(), s_one_clicked(), s_preview_draw(), s_SpaceAfterEntry_changed(), s_SpaceAfterSpin_changed(), s_spin_changed(), s_three_clicked(), s_two_clicked(), and s_window_draw(). References _connectsignals(), _constructWindowContents(), abiAddButton(), abiDialogNew(), BUTTON_CANCEL, BUTTON_OK, XAP_App::getStringSet(), XAP_StringSet::getValueUTF8(), XAP_Dialog::m_pApp, and s.
References AP_Dialog_Columns::getColumnOrder(), AP_Dialog_Columns::getPageHeight(), AP_Dialog_Columns::getPageWidth(), XAP_App::getStringSet(), XAP_StringSet::getValueUTF8(), label_button_with_abi_pixmap(), m_checkOrder, m_iSizeHeight, m_iSpaceAfter, m_oSpaceAfter_adj, m_oSpinSize_adj, XAP_Dialog::m_pApp, m_windowMain, m_wlineBetween, m_wMaxColumnHeightEntry, m_wMaxColumnHeightSpin, m_wpreviewArea, m_wSpaceAfterEntry, m_wSpaceAfterSpin, m_wSpin, m_wtoggleOne, m_wtoggleThree, m_wtoggleTwo, and s.
Referenced by event_Toggle(), and s_line_clicked(). 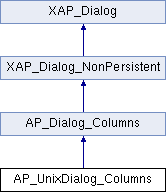 References AP_Dialog_Columns::getHeightString(), AP_Dialog_Columns::incrementMaxHeight(), m_iMaxColumnHeight, m_wMaxColumnHeightEntry, m_wMaxColumnHeightSpin, and UT_DEBUGMSG. References DIM_none, AP_Dialog_Columns::getHeightString(), m_iMaxColumnHeightID, m_wMaxColumnHeightEntry, AP_Dialog_Columns::setMaxHeight(), and UT_determineDimension(). References DIM_none, AP_Dialog_Columns::getSpaceAfterString(), m_iSpaceAfterID, m_wSpaceAfterEntry, AP_Dialog_Columns::setSpaceAfter(), and UT_determineDimension(). References AP_Dialog_Columns::getSpaceAfterString(), AP_Dialog_Columns::incrementSpaceAfter(), m_iSpaceAfter, m_wSpaceAfterEntry, m_wSpaceAfterSpin, and UT_DEBUGMSG. Referenced by s_preview_draw(), and s_window_draw(). References checkLineBetween(), AP_Columns_preview::draw(), m_oneHandlerID, AP_Dialog_Columns::m_pColumnsPreview, m_spinHandlerID, m_threeHandlerID, m_twoHandlerID, m_wSpin, m_wtoggleOne, m_wtoggleThree, m_wtoggleTwo, and AP_Dialog_Columns::setColumns(). Referenced by readSpin(), runModal(), s_one_clicked(), s_three_clicked(), and s_two_clicked(). References AP_Columns_preview::draw(), event_Toggle(), m_oneHandlerID, AP_Dialog_Columns::m_pColumnsPreview, m_threeHandlerID, m_twoHandlerID, m_wSpin, m_wtoggleOne, m_wtoggleThree, m_wtoggleTwo, and AP_Dialog_Columns::setColumns(). References _constructWindow(), AP_Dialog_Columns::_createPreviewFromGC(), _populateWindowData(), _storeWindowData(), abiDestroyWidget(), abiRunModalDialog(), BUTTON_CANCEL, BUTTON_OK, DELETEP, event_Cancel(), event_OK(), event_Toggle(), XAP_App::getApp(), AP_Dialog_Columns::getColumns(), XAP_Frame::getFrameImpl(), AP_Dialog_Columns::getHeightString(), AP_Dialog_Columns::getLineBetween(), AP_Dialog_Columns::getSpaceAfterString(), XAP_UnixFrameImpl::getTopLevelWindow(), GR_UnixCairoGraphics::init3dColors(), m_checkOrder, m_iMaxColumnHeightID, m_iSpaceAfterID, m_pPreviewWidget, m_wlineBetween, m_wMaxColumnHeightEntry, m_wpreviewArea, m_wSpaceAfterEntry, XAP_App::newGraphics(), AP_Dialog_Columns::setColumnOrder(), AP_Dialog_Columns::setLineBetween(), AP_Dialog_Columns::setViewAndDoc(), and UT_return_if_fail. Referenced by _constructWindowContents(), AP_UnixDialog_Columns(), and runModal(). Referenced by AP_UnixDialog_Columns(), and doHeightSpin(). Referenced by _connectsignals(), AP_UnixDialog_Columns(), doMaxHeightEntry(), and runModal(). Referenced by _constructWindowContents(), AP_UnixDialog_Columns(), and doSpaceAfterSpin(). Referenced by _connectsignals(), AP_UnixDialog_Columns(), doSpaceAfterEntry(), and runModal(). Referenced by _connectsignals(), event_Toggle(), and readSpin(). Referenced by AP_UnixDialog_Columns(), runModal(), and ~AP_UnixDialog_Columns(). Referenced by _connectsignals(), AP_UnixDialog_Columns(), and event_Toggle(). Referenced by _connectsignals(), _constructWindowContents(), and AP_UnixDialog_Columns(). Referenced by _connectsignals(), _constructWindowContents(), AP_UnixDialog_Columns(), checkLineBetween(), and runModal(). Referenced by _connectsignals(), _constructWindowContents(), doHeightSpin(), doMaxHeightEntry(), and runModal(). Referenced by _connectsignals(), _constructWindowContents(), AP_UnixDialog_Columns(), and doHeightSpin(). Referenced by _connectsignals(), _constructWindowContents(), AP_UnixDialog_Columns(), and runModal(). Referenced by _connectsignals(), _constructWindowContents(), doSpaceAfterEntry(), doSpaceAfterSpin(), and runModal(). Referenced by _connectsignals(), _constructWindowContents(), AP_UnixDialog_Columns(), and doSpaceAfterSpin(). Referenced by _connectsignals(), _constructWindowContents(), AP_UnixDialog_Columns(), event_Toggle(), and readSpin().